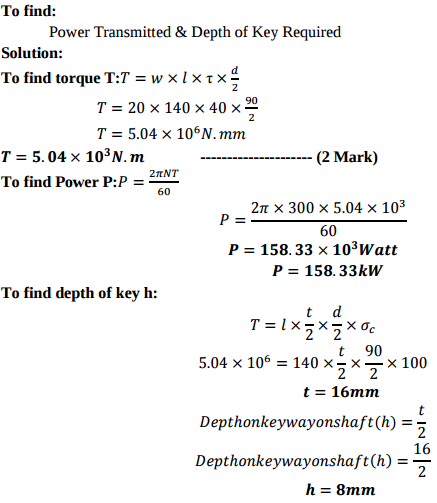 State the effect of keyway on the strength of the shaft. The keyway is a slot machined either on the shaft or in hub to accommodate the key. It is cut by vertical or horizontal milling cutter. 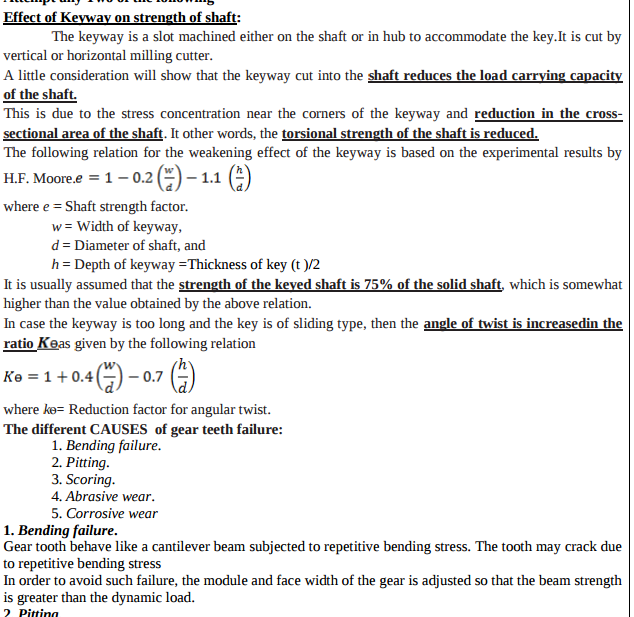 A little consideration will show that the keyway cut into the shaft reduces the load carrying capacity of the shaft. This is due to the stress concentration near the corners of the keyway and reduction in the crosssectional area of the shaft. 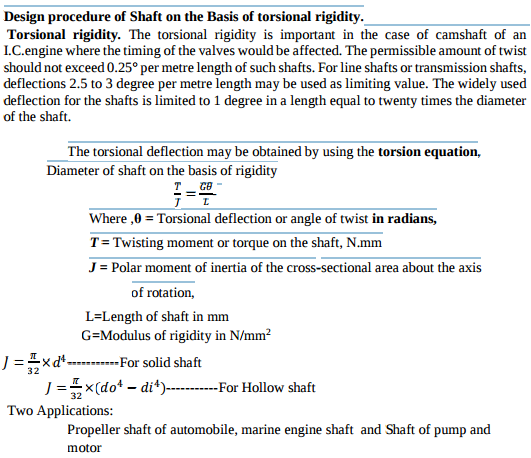 It other words, the torsional strength of the shaft is reduced. 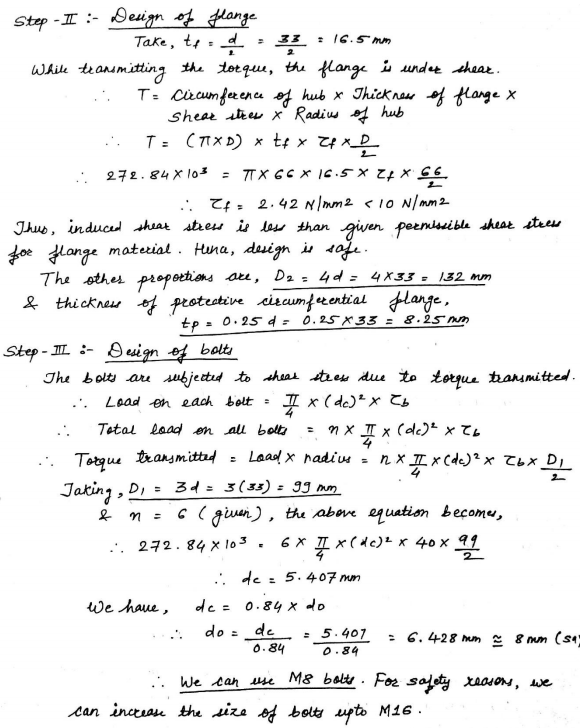 The following relation for the weakening effect of the keyway is based on the experimental results by H.F. Moore. A hollow shaft for a rotary compressor is to be designed to transmit maximum torque of 4750 N-m. 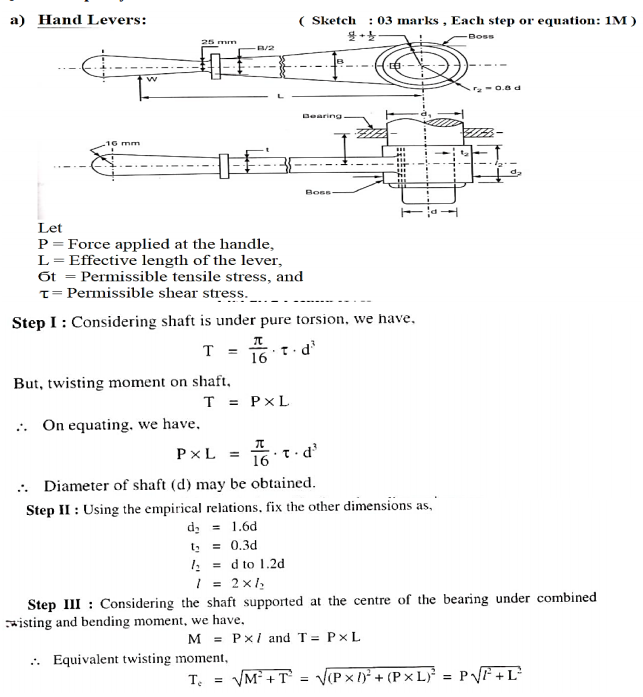 The shear stress in the shaft is limited to 50 MPa. 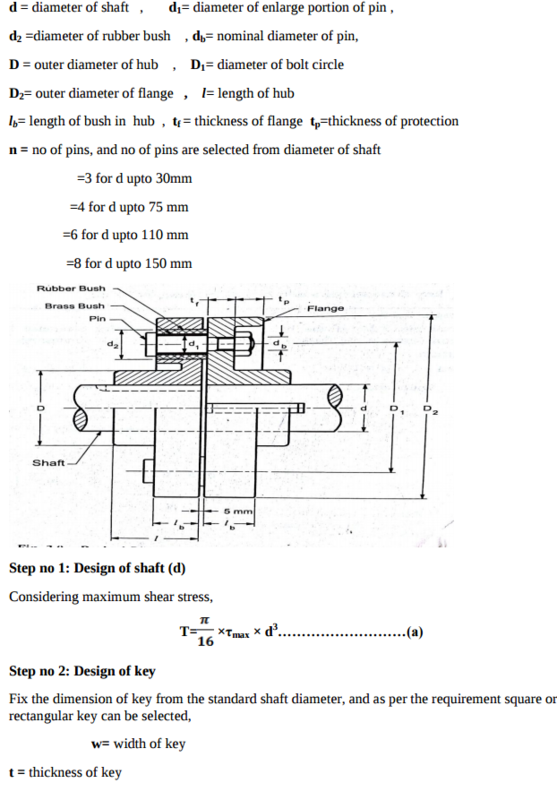 Determine the inside outside diameter of the shaft if the ratio of inside to outside diameter of the shaft is 0.4. Draw neat sketch of a protected type flanged coupling showing all details. distance to some degree. 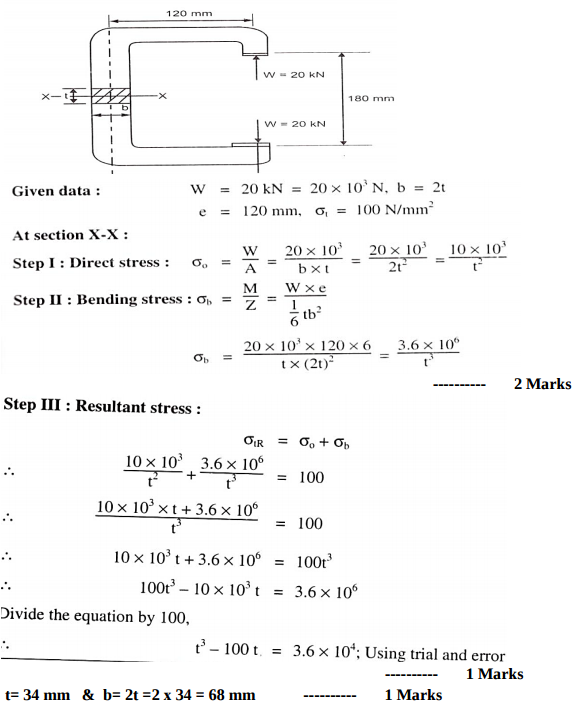 c) For effective conjugate action i.e for maintaining a constant velocity ration, in case of involute gearing system, the center distance can be changed without affecting angular velocity ratio. d)In involute gearing as the path of contact is a straight line and the pressure angle is constant . A shaft 30 mm. diameter is transmitting power at a maximum shear stress of 80 MPa. 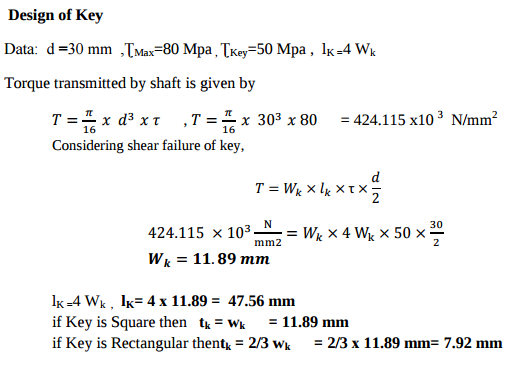 If a pulley is connected to the shaft by means of a key, find the dimension of the key so that stress in the key is not to exceed 50 MPa and length of the key is 4 times the width. Comparison of welded joints with screwed joint. 1) Welded Joint is rigid & permanent. Screwed joint is temporary. 2) Cost of welded assembly is lower than that of screwed joints. 3) Strength of welded structure is more than screwed joints. 4) For welding joints, highly skilled worker are required 5) Welded joints are tight & leak proof as compared to Screwed joints. 6) Welded joint is very difficult to inspect compared to other joints. high speed or supply of lubricant fails. it is stick-slip phenomenon in which alternate shearing and welding takes place rapidly at high spots. Remedies- by proper designing of the parameters such as speed, pressure and proper flow of lubricant, so that the temperature at the rubbing faces is within the permissible limits. 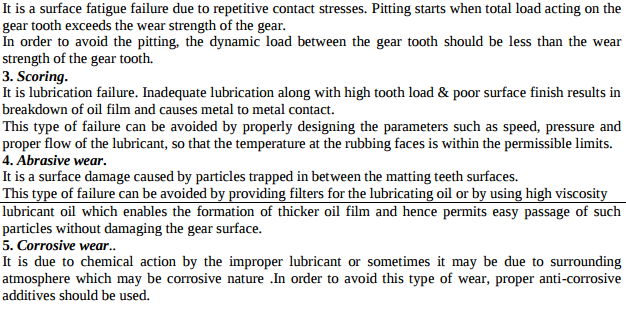 4)Abrasive wear- the foreign particles of lubricants such as dirt, dust or burr enter between the tooth and damage the form of tooth Remedies- by providing filters for the lubricating oil or using high viscosity lubricant oil which unable the formation of thicker oil film and hence permits easy passage of such particles with ought damage of gear tooth surface. 5)Corrosive wear- due to presence of corrosive elements such as additives present in the lubricating oils. Remedies- proper anti corrosive additives should be used. State four types of keys. What are the requirement of a good coupling? 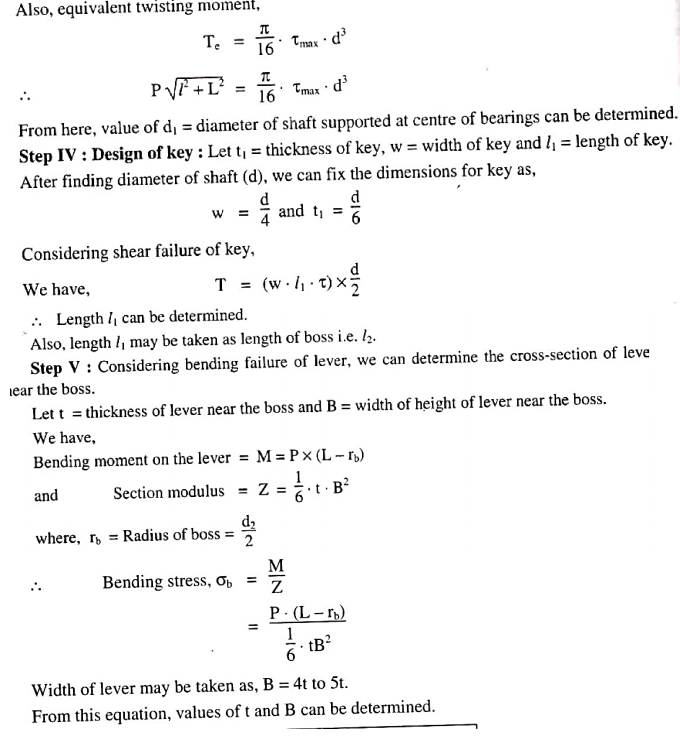 What are the considerations in design of dimensions of formed and parallel key having rectangular cross section? State any four factors to be considered while selecting the coupling. A belt pulley is fastened to a 90 mm diameter shaft running at 300 r.p.m. by means of a key 20 mm wide and 140 mm long. Allowable stress for the shaft and key material are 40 N/mm2 in shear and 100 N/mm2 in crushing. Find the power transmitted and the depth of the key required. 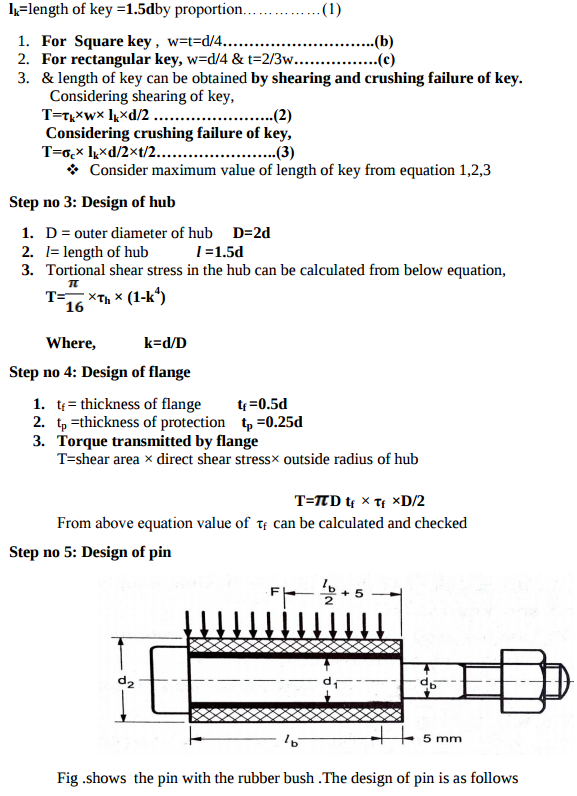 Prove that, for a square key, the permissible crushing stress is twice the permissible shear stress. Coupling should be placed as close to a bearing because of following reasons i. It gives minimum vibrations ii. 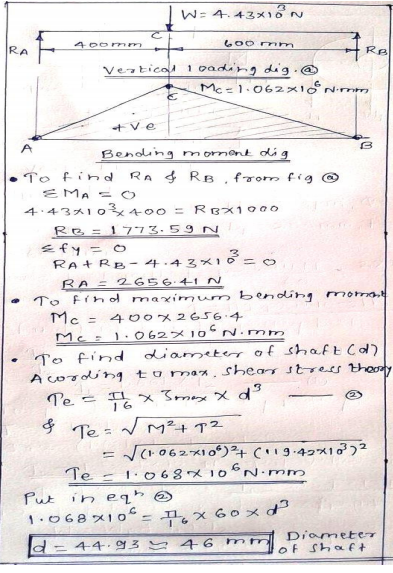 Bending load on the shaft can be minimized iii. It increases power transmission stability. iv. To avoid deflections of shaft. 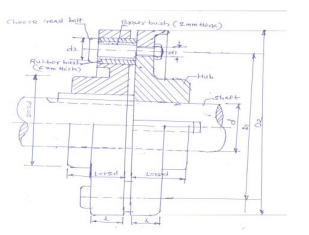 Draw a neat sketch of flexible flange coupling and label its main components. A hollow shaft is required to transmit 50 kW power at 600 rpm. Calculate its inside and outside diameters if its ratio is 0.8. Consider yield strength of material as 380N/mm2 and factor of safety as 4. 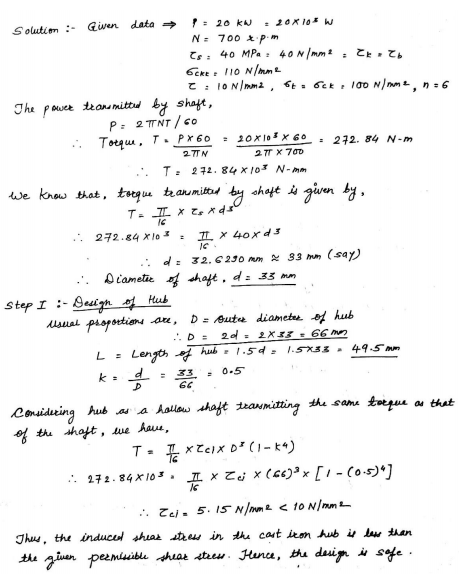 State the ‘Lewis equation’ for spur gear design. State SI unit of each term in the equation. 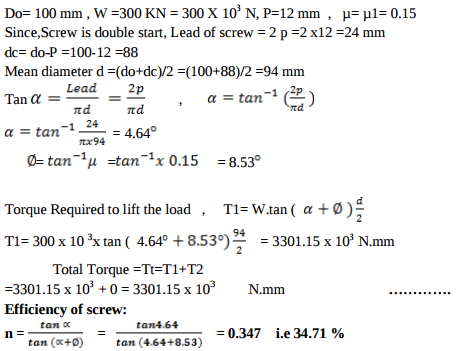 Lewis equation: WT = σw.b.π.m.y, WT= Tangential load acting at the tooth in N σw= bending stress in N/mm2 b= width of the gear face in mm m= module in mm y= lewis form factor. 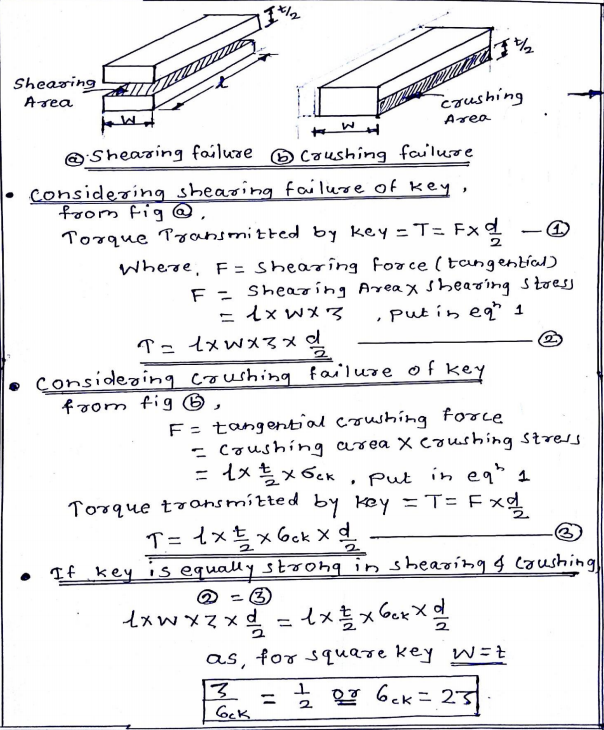 Prove that for a square key sc = 2t where sc = crushing stress t = shear stress. State four important modes of gear failure. A shaft 1000 mm long is supported between two bearings. A pulley of 250 mm diameter is keyed at 400 mm distance away from left hand bearing. The power transmitted by shaft is 10 kW at 800 r.p.m. The pulley gives power to another pulley vertically below it having an angle of contact between pulley and belt as 180°. The weight of pulley is 300 N. The coefficient of friction between belt and pulley is 0.15. 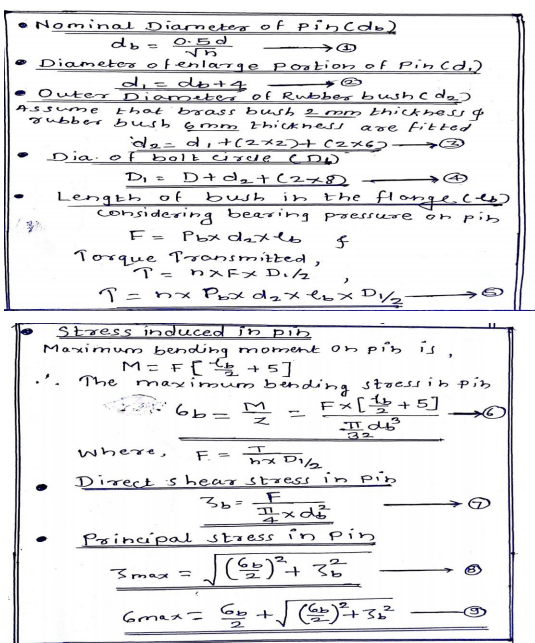 Take shear stress for shaft material as 60 MPa. 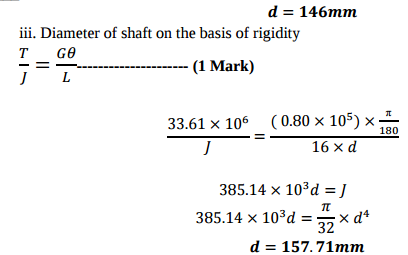 Find the diameter of the shaft. Explain the design procedure of handlever with neat sketch. It consist of two shafts, two key, flanges, key, pin, rubber bush, brass bush, & pin ,following are the designations of various coupling dimensions which are use for the design procedure. How keys are classified? Give detailed classification of keys with neat sketches; also state their applications. State the different modes of failure of gear teeth and their possible remedies to avoid the failure. 1. Bending failure. 2. Pitting. 3. Scoring. 4. Abrasive wear. 5. Corrosive wear Remedies to avoid failure: 1. Bending failure. In order to avoid such failure, the module and face width of the gear is adjusted so that the beam strength is greater than the dynamic load. 2. Pitting. In order to avoid the pitting, the dynamic load between the gear tooth should be less than the wear strength of the gear tooth. 3. Scoring. This type of failure can be avoided by properly designing the parameters such as speed, pressure and proper flow of the lubricant, so that the temperature at the rubbing faces is within the permissible limits. 4. Abrasive wear. This type of failure can be avoided by providing filters for the lubricating oil or by using high viscosity lubricant oil which enables the formation of thicker oil film and hence permits easy passage of such particles without damaging the gear surface. 5. Corrosive wear.. In order to avoid this type of wear, proper anti-corrosive additives should be used.